Join the growing number of schools in the Hoopitup! Kidz program. Using our F.U.N. approach we are bringing a positive fitness, health and nutritional message to kids of all ages. We can work with individual schools or set up tours for your entire school district. We also customize our assemblies for after school enrichment programs, special events or partnerships with organizations, governemnet agencies, corporations, foundations and more. Our "HOOPITUP! 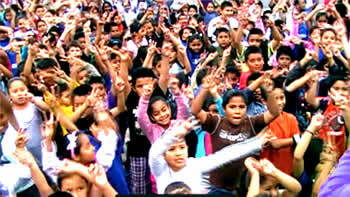 KIDZ DANCE PARTY" provides one of the most popular Kid's parties in the state of California. Our top children's entertainers will take your kids on an unforgettable journey through the world of hooping. With our specially designed hoops and easy to learn methods your kids will be hooping and grooving within minutes. The adventure continues with a dance journey through the decades from the latest to the greatest dance moves of all time. All while in or outside the hoop. Hoopitup! parties include dancing, games, and contests promoting positive energy, self-esteem, and fitness. Adult alert!!! Our parties are so awesome and exciting, before you know it, you just might find yourself inside the hoop. Our Hoopitup! 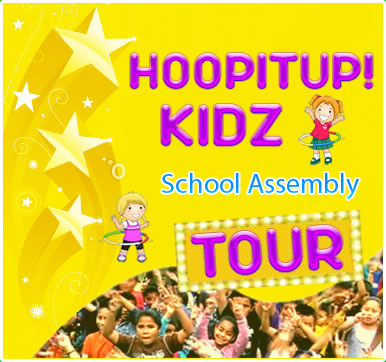 Kidz program will take your entire school on an action-packed, fun-filled health and fitness journey inside the hoop. Your kids will learn over thirty hoop tricks with the latest dance music, the coolest dance moves, and our F.U.N. approach. Call us now and get our promotional pricing. Fis "Fitness Made Fun". Our School assemblies are a Fitness Phenomenon for kids and adults alike. Let our world renowned, certified fitness and hoop experts take your entire school on a 60 minute cardiovascular workout with or without the hoop, guaranteeing nearly 100% participation. 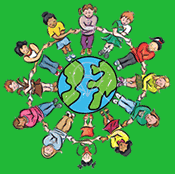 We believe fit and healthy kids are the new positive energy source for planet earth! 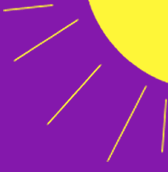 U is for "Uplifting and Inspirational". We uplift your entire school with inspiring messages of health,fitness, and self-esteem, creating a positive wave of school unity and a feeling that together anything is possible. N is for "Nutrition" and the importance of healthy living. Hoopitup! empowers the kids with a strong nutritional message of making healthier food choices that are great for themsleves and great for the planet. Hoopitup! Kidz are on the front lines for obesity prevention. Some of our topics include the full content of the USDA approved food pyramid, the ABC's of self esteem, messages of Anti-bullying, and important information for preserving the planet. We give your kids positive messages of self-esteem and anti-bullying. Teaching kids the importance of recycling, cleaning up the environment, planting trees and utilizing clean fuels and bio-degradable products. Our presentation can easily be customized to support your children's achievement or character building program. From elementary to high school we can provide an age appropriate show that will inspire and motivate your students with keys to success that can radically change their lives today. With messages of health, fitness and positive thinking Hoopitup! Kidz are re-shaping the generations of tomorrow. Check out our testimonials below. HOOPITUP! KIDS travels all around the globe bringing positive messages of health, fitness, nutrition and peace to all places where kids gather, including school assembies, birthday parties, celebrations, summer camps, benefits, charities, fairs and all other kids events. "This was the best assembly ever. Awesome. Awesome. Awesome. I want you to come back again every year. It got the kids involved and it got them to exercise straight for an hour without one complaint...And we got to exercise too. We love it. Thank you so much." "That was the best assembly we've ever had in all of the ten years I've been at this school. It was incredible. We never had so much fun. It was fantastic. Please, please come again."